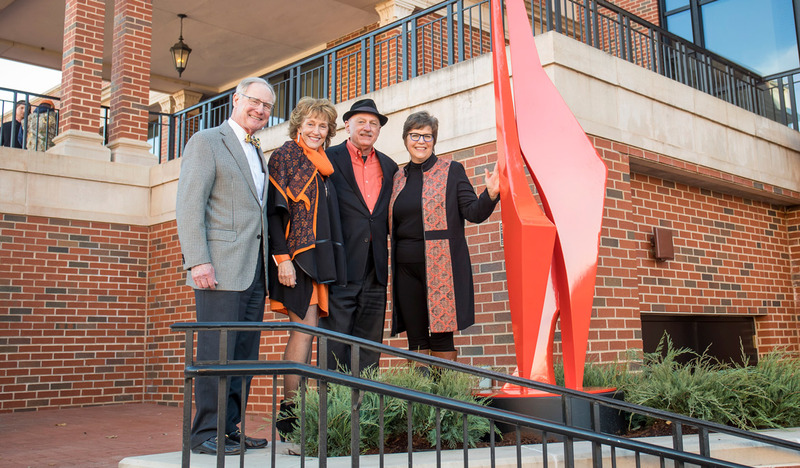 Pictured are (from left) OSU President Burns Hargis, First Cowgirl Ann Hargis, James Pickel (class of ’72), and Victoria Berry, director of the Oklahoma State University Museum of Art. A second Allan Houser sculpture, this one perfectly matched to America’s Brightest Orange, was unveiled Wednesday during a ceremony hosted by Oklahoma State University President Burns Hargis and First Cowgirl Ann Hargis. Abstract Orange is a continuation of OSU’s initiative of integrating public art on campus.